'Earth-Race' ($3Million Boat) Sunk ! oh, there is video of the crash...enjoy! Old news or new news it doesnt matter....its pretty obvious that the whaling vessel makes a last second maneuver towards the civilian vessel. They then probably went and murdered several whales in celebration afterwards. I don't know about the maritime law involved, but the "playground law" is pretty straight forward. You don't play chicken with someone 100 times your size. I'd want to see a wider angle shot to determine if the ship was dodging a rubber raft to port before I made any real judgment on the situation. Other footage I've seen, when this first happened, it appeared the activists veered in front, leaving not much time for the whaler to adjust. "Playground law" is exactly what they're relying on - playing chicken is how they get media coverage, so if someone gets hurt, that just means more attention. Oh, new season starts early June. This event should be included this season, I think. I agree with Mariness. Videos I've seen indicate the EarthRace boat accelerated into the whaler's path causing the accident. They got off luckier than they deserve. "Playground law" is exactly what they're relying on - playing chicken is how they get media coverage, . Yes, I love whales, but I would love to harpoon Sea Shepherd. When large vessels change course, the bow does not move sideways--the stern does. I am sure the small boat crew knew this. Still, a shame to lose the boat. A local friend of mine did a leg on the RTW trip, and said the boat was an amazing piece of work. Look on the bright side, now it's an artificial reef for homeless fish. The vessel fka Earth Race did a RTW, and even set a record. I presume that means the route included rounding the great southern capes - right? Oh, it didn't? Imagine that. Is there a WSSRC equivalent maybe the WSMRC, that monitors such claims? 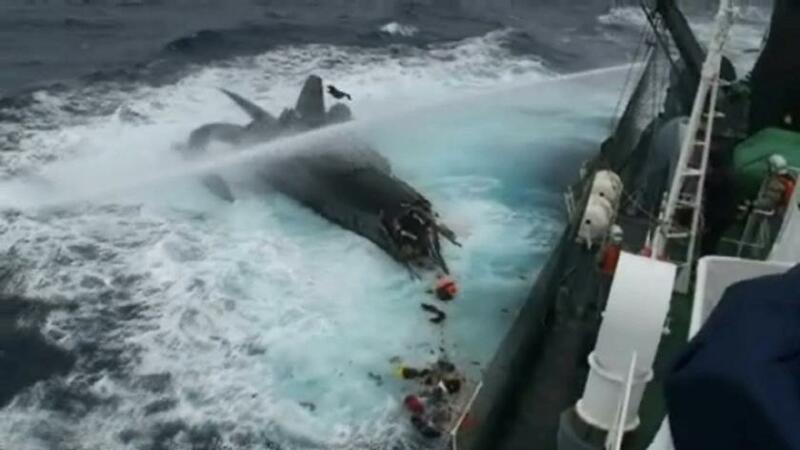 From last January: Anti-Whaling Activists Cool Boat Sinking. When that boat was in Portland, I kayaked up to it and took lots of pictures. Too bad the guy joined up with the Whale Wars folks and played chicken with somebody out of his class and lost. Was really impressed with that boat. I actually remember that boat was for sale.. I guess, the selling price now is REALLY cheap.. It looks a bit too delicate for ramming whaling ships.